Left to right: Michele Lynch, David Weller, Ambassador Shinsuke Sugiyama, Ambassador Stuart Holliday, The Honorable Ann Stock. 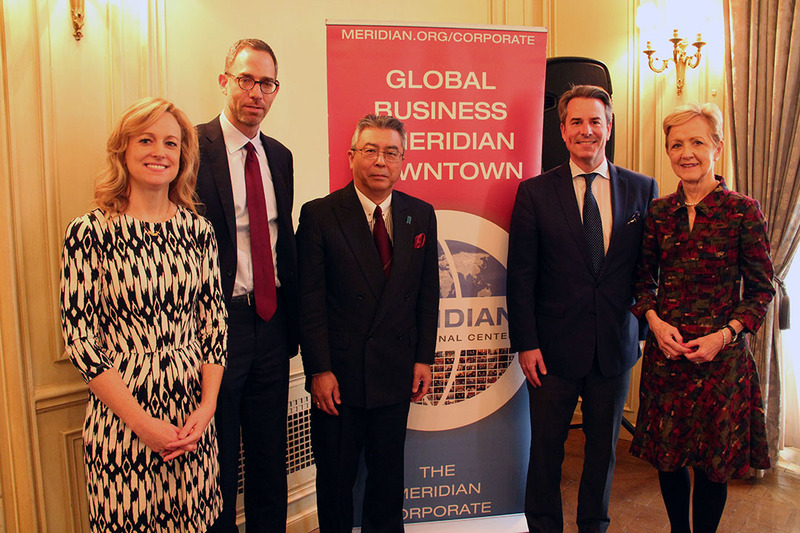 On November 2, 2018, Google partnered with the Meridian Corporate Council to host a luncheon program featuring the Ambassador of Japan, His Excellency Shinsuke J. Sugiyama. Beginning with opening remarks from Ambassador Stuart Holliday and Google’s Head of Global Trade Policy, David Weller, the discussion focused on the economic future of Japan and the United States, as well as the growing role of technological development in both countries. Ambassador Sugiyama underscored the importance of the U.S.-Japanese alliance and the American defense aid, as well as Japanese technological advances that also benefit the U.S. military and government. Ambassador Sugiyama explained the four greatest challenges facing Japan and how the United States could help resolve these problems. He went into detail highlighting these main issues, which included the question of the aging population of the Japanese workforce and how labor is going to be replaced as the population ages, as well as the creation of a more tolerant Japanese society regarding immigration. Immigrants in Japan are paramount to the reinvigoration of the Japanese economy, especially those with technological expertise, Ambassador Sugiyama said. Additionally, the labor market and the need to empower women in the workforce is particularly significant to Ambassador Sugiyama. He stated that Japan needed to follow the example of the United States and provide more opportunities for women to ascend the corporate ladder, as well as appoint more female diplomats. Ambassador Sugiyama said he looks forward to this issue being emphasized during the upcoming G-20 in Osaka, particularly the topic of the future of female empowerment in Japanese businesses and government. 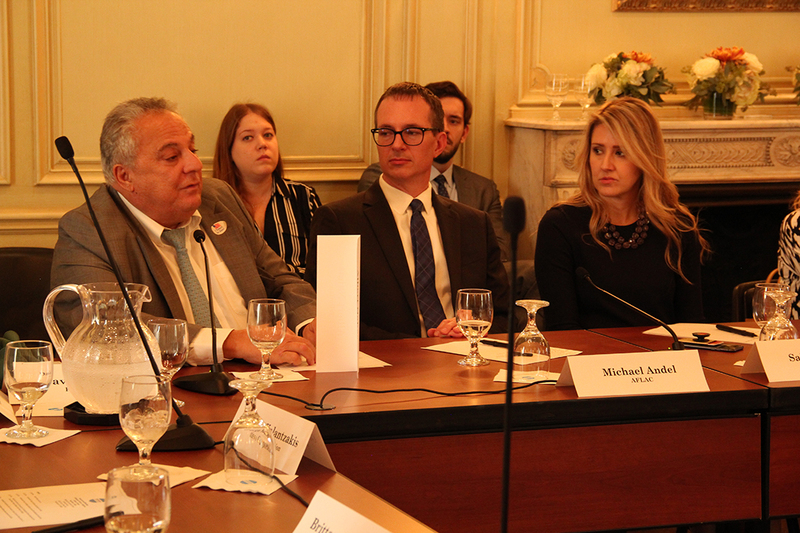 Lastly, the Ambassador addressed the current state and future of trade with the United States. He discussed his belief that the Trans-Pacific Partnership (TPP) was the best option to empower developing countries in the Far East and would yield the best benefits for the United States. However, if the United States could not reach an agreement surrounding the TPP, it would be necessary that a Japanese-American bilateral trade agreement be created. 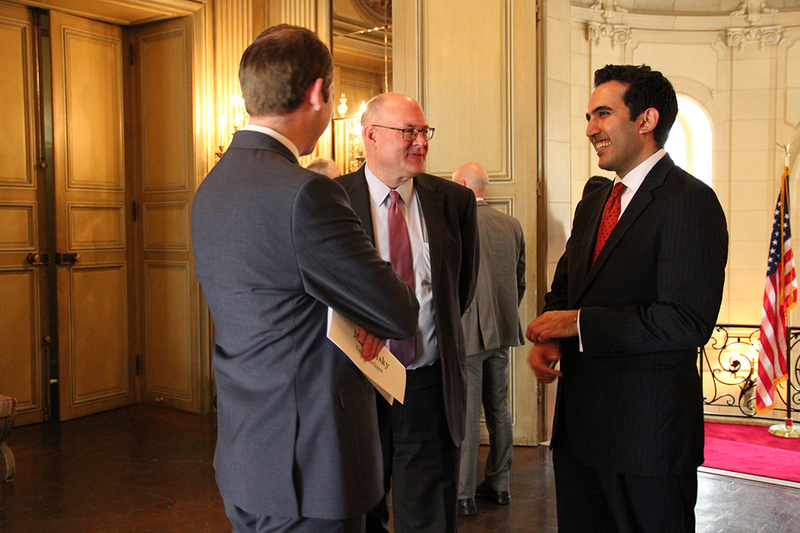 Puru Trivedi, Steve Morrissey, and Max Slutsky confer in Meridian House before Ambassador Sugiyama’s remarks. Ambassador Sugiyama gives his views on the future trade partnership between the United States and Japan. 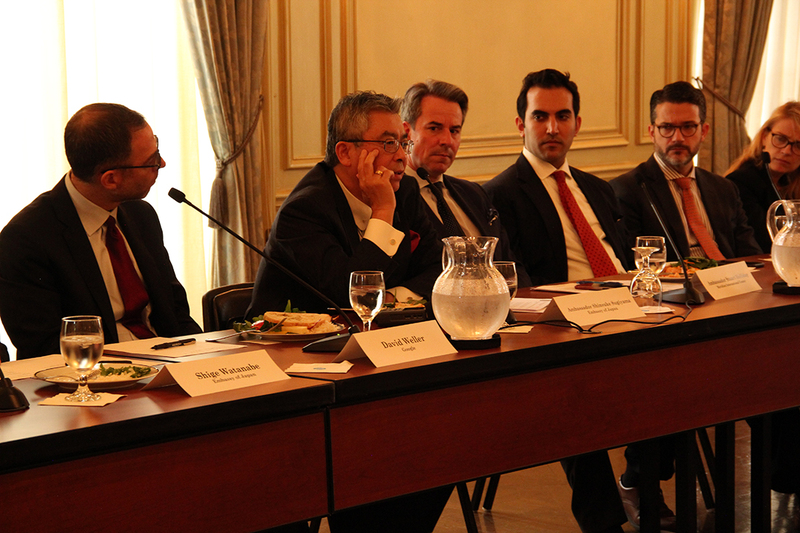 Albert Nahas asks a question during the Q&A session following Ambassador Sugiyama’s remarks on Japan’s key topics of focus.